Today on 07th February 2019, Pakistan Civil Aviation Authority Allama Iqbal International Airport Management held Safety Awareness Session and FOD (Foreign Object Debris) awareness walk on Airside. 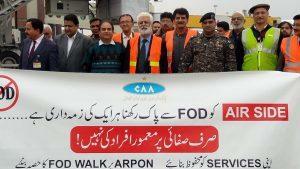 The session was attended by officials of CAA, ASF, ANF, PIA and other International and Local airlines followed by FOD Walk. 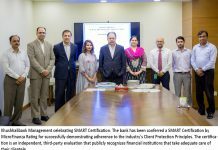 The walk was led by Airport Manager, Sardar Tahir Sikandar along with DMR Safety & Quality Management System, CSO ASF Mr. Tasleem Akhtar, Chairman Airlines Operator Committee (AOC), Station Managers of PIA, Emirates, Gulf Air and other Airline / GSA’s. Large number of operational personal participated in the event and pledged to play their vital role in maintaining safe environment for Aircraft Operations at AIIAP, Lahore. At the end of event, the participants were sensitized by APM regarding the importance of safety culture in aviation.